Amtrak has a U.S. Rail pass for as little as $439. That will get an adult 8 segments (stops) in 15 days. It’s an affordable way to see the country with enjoy riding a train as part of the travel experience. My husband and I traveled from Baltimore to Truckee, CA using this U.S. Rail Pass. It was easy, inexpensive and much less stressful than driving or flying. Our eight segments were Baltimore – Washington, Chicago (the Amtrak hub), Granby CO, Grand Junction CO, Truckee CA, Chicago, Washington DC, Baltimore. We did it in under two weeks and spent nine nights in three fantastic western towns. The rail pass gets you a coach seat. On one of the sightseeing trains, a coach seat has electrical outlets, private reading lights, drop-down trays, and chair that reclines like a Lazy-Boy recliner rather than just a mere tip backward like a bus or train. If you can sleep in a Lazy-Boy, you can sleep on a train. Your bags are only a short walk away, and there’s no drama with security. You just get up, walk downstairs, find your bag and get what you need. Also, you can bring a ginormous bag and not worry about the airlines fining you for oversize luggage. The bathroom and your luggage are in your railroad car. We didn’t stay in our coach seats except for when we wanted to nap, sleep or read. 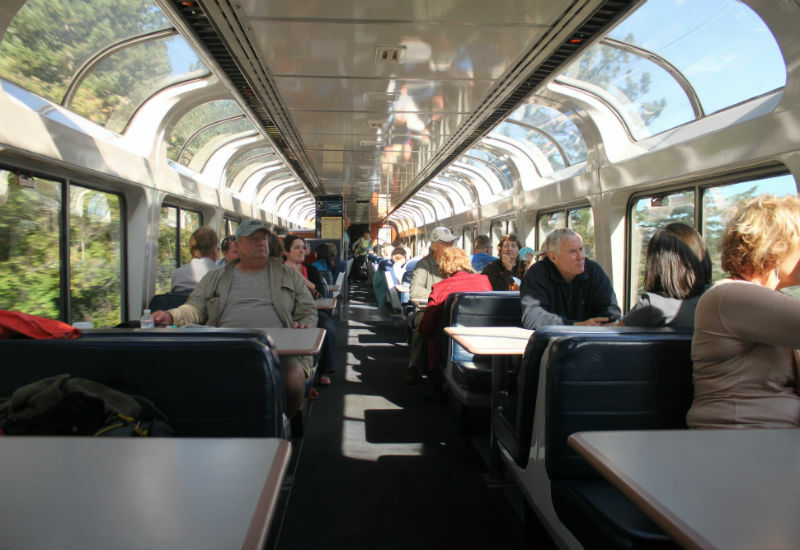 On these cross-country trains there’s a big sightseeing car next to the dining car. It’s wall-to-wall windows with swivel chairs and booth-type diner seating. It’s very comfortable and allows you to see on both sides of the car. It’s a great place to meet new people. The cheapest adult rail pass is $439 and allows up to 8 segments to be taken in 15 days. A segment is a stop, and reservations must be made for each stop because the trains don’t stop at stations when there’s nobody set to be dropped off or picked up. I went to Amtrak website and viewed the online train routes and schedules to chose our segments. All trains meet in Chicago, so we headed there to pick up the California Zephyr. Then I chose Granby Colorado as our first stop on the Zephyr because it was the stop closest to Rocky Mountain National Park. 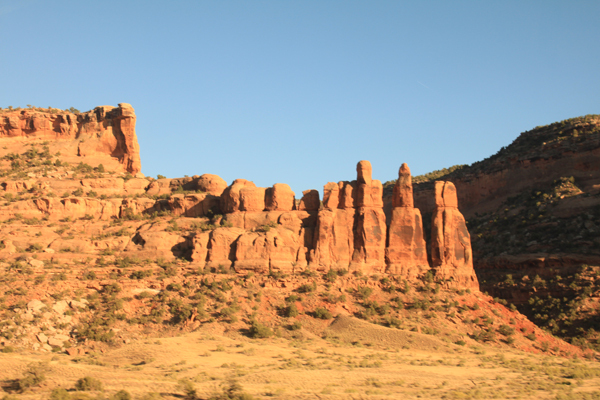 The next segment I chose was Grand Junction, Colorado because we wanted to see the Colorado National Monument and tour Colorado’s wine country. Our final stop was Truckee, California because we wanted to see the Sierra Nevadas, Donner Lake, Squaw Valley, Lake Tahoe and the Truckee River. We stayed three nights in each place. Count in the total of four days to travel and we came in just under our fifteen day allotment. Understand that once you purchase the rail pass, you must reserve the segments with an Amtrak agent. This can be done by phone. DO NOT TRY TO DO THIS ONLINE. The online system doesn’t play well with Amtrak. I first did mine online and it was a fiasco. The process went perfectly when I called the reservations line and made the reservations. Lots of people bring their own food and eat at their seats, and there’s a snack bar for drinks and vending machine style snacks. But the dining car, while pricey ($20 per person w/ tip for dinners) is a worthwhile experience at least a few times on the trip. The food we had was good and we were seated with other couples. We met so many interesting people. Here’s the menu for the California Zephyr – the train that goes from Chicago to San Francisco – and known as the most scenic rail ride in the North America. Truth be told – I hate sleeping in a recliner. So I inquired about upgrading to a sleeper (roomette) once we were on board. We were able to get a sleeper for $210 for the one night from Chicago to Granby. The roomette is only as big as two rail seats facing each other with one foot of space between the door and the seat. Both seats fold down to become a bed, a top bunk folds down for a second bed and curtains are drawn for privacy. The price of the roomette also includes your meals, a porter (who will bring you your meals if you’d rather skip the dining car), coffee, newspaper, bottled water and access to the shower. Prices for sleeping accommodations on a train are sold similarly to the way airlines sell tickets. Book far in advance and you’re likely to get the best deal. Book 3 days before departure and you’ll pay the highest price. But, book while you’re on board and you may get a great deal because the rooms are empty. That’s what happened for us. So if you’re willing to take a chance and NOT get a good deal, ask for the upgrade once you’re on board. It’s perfectly marvelous sleeping on a train. Even the top bunk (which I swear is the size of a wide ironing board) is a comfortable experience. Take the train for the added travel experience. There’s almost nothing good about flying these days – except speed. Car travel can be exhausting, stressful and expensive. And traveling long distances in the US by car often puts the driver on Interstate Highways and Turnpikes where the majority of scenery is comprised of concrete, asphalt and steel highway signs. But trains snake through the American landscape, sometimes going places where there are no roads. On the route from Denver to Truckee there are parts of the mountains and desserts that almost no one sees unless they’re traveling by train or paddling down the Colorado River. A train ride is relaxing. It’s a mode of transportation that becomes part of the travel experience instead of penance leading up to the travel experience. We reserved a car in Granby because we knew we wanted to drive through Rocky Mountain National Park and the surrounding areas. But we didn’t rent a car in Grand Junction and Truckee because we were staying right in town and figured we’d spend lots of time in the town and use the public transportation system. This was dumb. Renting a car for a few days is cheap, especially considering the flexibility it gives you. Car rental companies will often meet you at the station with your rental car – even in very small towns. Having the car hired and the hotel booked in advance makes a perfectly smooth transition. Our experience with Amtrak was wonderful as long as we were speaking to people and not trying to do anything on line. Communicating with Amtrak reminded me of communication with the government. Each person knows his or her job, but there is no collective understanding. I booked my rail passes on line and made all the segment reservations. When I got confused I called Amtrak and realized the entire transaction was void because the segments couldn’t be reserved online (even though the online application allowed the user to reserve them). After I finished booking all the segments on the phone, things went perfectly. Same was true with upgrading to a roomette. Just ask the conductor. My husband and I loved our rail vacation and hope to ride the Adirondack, Coastal Starlight and the Sunset Limited in the near future. My husband and I traveled via railpass from Orlando, Florida to Seattle, down the coast of California and on through the Rocky Mts….BEST trip of my life….Ours is such a gorgeous country. Natalie, the pass I referred to was the 15 day – 8 segment pass. There are actually 3 options. With the 15 day / 8 segment pass, a passholder can use the pass for up to 8 segments (a segment occurs when you board a train). All 8 segments must be used within 15 days and advanced registration is required. For example – We got on in Baltimore and got off in Chigago (1 segment), then we got on the Zephyr in Chicago and went to Granby (segment #2). Then we boarded a train in Granby and went to Grand Junction (segment #3). 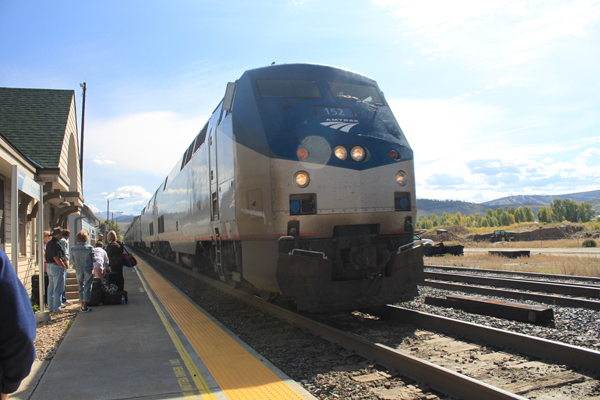 Then we boarded in Grand Junction and went to Truckee CA (segment #4). Then we boarded in Truckee and went clear back to Chicago (segment #5). Then our final segment was Chicago back to Baltimore (#segment 6). We did all of this within 15 days and booked all the reservations in advance. So we only used 6 of our 8 segments. Hope this helps. Are there showers available for coach users on the Amtrak trains? Yes, Paul. There’s a nice large shower on the lower level of the sleeper cars. Mindie, thanks for this great blog. When you say there is a shower, is that available to passengers who have not booked a sleeper? LuAnnR… I wasn’t clear. The showers are only for those who have booked in the sleeper car. Coach passengers do not get access. I traveled by train as a kid in the 40’s and as a teen in the 60’s. My husband & I talk about this kind of trip-Because of your experience. We both have been across country by car…but this is delightful. When the time gets close I will be checking this out. Thanks so much for this write up. I decided to get this 15 day pass for my daughter and I for her graduation present next year, and just let her book the trips. She LOVES trains, and in fact, that’s all she wants to do when we visit Chicago is ride MTA Trains… I’m thinking that a cross-country train trip might send her over the moon. Your info about booking was very helpful, and I think this will make it a much more rewarding experience!